When you are tired of your stressing everyday life this is the moment to enjoy this wonderful mediterranean oasis at Lake Garda which is offering tours in the nature, history and the possibility of unique relaxation. Hike in a particularly scenic landscape - departing from Rovereto with our mini-van, we are heading towards Lake Garda until we have reached the starting point of our trips at the village of TENNO (ca. 45 min by car). A footpath is leading us through meadows and pastures, passing characteristic alps. The difference of altitude which has to be mastered is ca. 700 m. We will take our lunchbreak on Peak Mughera, a mountain top located high above the Lake from where we can enjoy a fantastic view over the entire Lake and the surrounding mountain chains. Descent to LIMONE ca. 2 hrs. From Limone back to Riva by ferry boat - end of the trip. Back to Rovereto and/or your hotel. Tour in a particularly scenic landscape - We are departing from Rovereto with our mini-van. Our main direction is Torbole but prior we will turn off to Brentonico. After approx. 40 min. by car, we will hike to a mountain lodge which is located at an altitude of 1.650 m. This is the starting point of our hike. A path which has been constructed during World War I is leading us through the famous Natural Parc of MONTE BALDO. After approx. 2 hrs., we will reach the mountain top which is very close to an alpine lodge where we can have a break. Very often this peak is being called the "balcony" over Lake Garda as from there it is possible to view the entire Lake, the Dolomites and the famous Adamello Mountain chain. Back to Rovereto and/or your hotel. 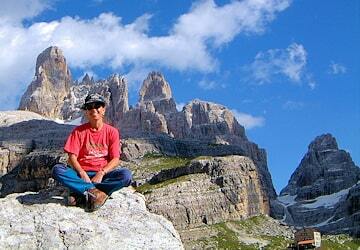 Mountaineering trips in particularly scenic landscape of Italian Alps against a great historical background. Departing from Rovereto with our mini-van we are heading towards Vicenza. After ca. 60 min by car we have reached the starting point of our tour at "Passo Xomo". There we find one of the most incredible constructions created by the soldiers who had been fighting here during Word War I: a "trail" built through the rocks - consisting of 52 tunnels some of which are up to 300 m long. We are following this "road of war" with its tunnels until we reach the mountain lodge "Rifugio Papa" where we can have a snack. Ascent to "PALON Peak" (2.230 m). The entire surrounding area was the arena of the merciless battles during World War I and is still rich of many remainders. From an alpinistic point of view this tour is not difficult although it is rather long. Wonderful panorama; with good weather it even possible to see Venice and the Adriatic Sea. Back to Rovereto and/or your hotel. Extremely interesting tour in the National Park and the surroundings of the glacial lakes in the Italian Alps. Departing from Rovereto with our mini-van, we are heading towards MADONNA DI CAMPIGLIO until we have reached the starting point of our trip after ca. 90 min. by car. A footpath through a forest will lead our hike to the first lake Nambino and following to - Lake Nero - Lake Serodoli and at the top of our trip - Lake Gelato - 2.390 m. On the way back we are passing near the fifth lake Lambin and further on to the mountain lodge Nambin (break). In about 20 min. from the lodge we will arrive at our mini-van which will take us back to Rovereto and/or your hotel. Extremely scenic tour in the astounding surroundings of towers and eternal walls. Departing from Rovereto with our mini-van, we are heading towards MADONNA DI CAMPIGLIO until we have reached the starting point of our mountaineering tour after ca. 90 min. by car. After ca. 2 hrs. on a footpath through a pine forest, we will reach the mountain lodge "Rif. Brentei". An alpinistic path is leading us to the famous "Bocca di Brenta (2.550 m) which is situated in the heart of the Brenta group. After approx. 2 hours we reach another mountain lodge, "Rifugio Pedrotti alla Tosa" where you can have a snack. Descent and way back (ca. 3 hrs.) to our mini-van. Back to Rovereto and/or your hotel. Departing from our meeting point with our mini-van, we are heading towards FASSA VALLEY. After ca. 90 min. by car, we have reached LAKE FEDAIA from where we will take the cableway to the mountain lodge "Rifugio Pian dei Fiacconi" (2.625 m). On the adjacent glacier we will teach and practise the correct use of pick and crampons in ascent and descent. Overnight stay in "Pian dei Fiacconi" lodge. Next day: crossing of the glacier and ascent to the peak of MARMOLADA (ca. 3 hrs.). Descent to "Pian dei Fiacconi" lodge and easy path back to where we have parked our mini-van at LAKE FEDAIA. Transfer back to ORA/AUER train station and/or your hotel. Extremely scenic tour in the astounding surroundings of towers and eternal walls which can be admired from the vicinity. 1st DAY - Departing from Rovereto with our mini-van, we are heading towards MADONNA DI CAMPIGLIO until we have reached the starting point of our route after ca. 90 min. by car. After ca. 2 hrs. on a footpath through a pine forest, we will reach the mountain lodge "Rif. Brentei" at an altitude of 2.180 m. Overnight stay. 2nd DAY - Ascent to "Bocca di Brenta" - on VIA FERRATA DELLE BOCCHETTE CENTRALI to the mountain lodge ALIMONTA (2.580 m) - ca. 6 hrs. Overnight stay. 3rd DAY - Ascent to "Vedretta degli Sfulmini" - on VIA FERRATA DELLE BOCCHETTE ALTE to BOCCA DI TUKKETT - downhill to the mountain lodge RIFUGIO TUCKETT and back to the valley an our mini-van. Duration: ca. 8 hrs. Back to Rovereto and/or your hotel. VARIANT - instead to go back to the valley, it is possible to stay overnight in the mountain lodge RIFUGIO TUCKETT and to descend to the valley on the following day. High-alpine tour against a famous historical background. The crossing of Mandron, Lobbie and Lares GLACIER is the dream of each mountaineer; involve many technical difficulty and the prerequisite for the participation at this tour is an excellent physical condition and mountaineering experience. 1st DAY - Departing from Rovereto with our mini-van we are heading towards Madonna di Campiglio. After appx. 90 min. by car we have reached BORZAGO Valley which is the starting point of our mountaineering tour. After ascent ca. 4 hrs. we will arrive at the mountain lodge RIFUGIO CARE' ALTO (2.460 m) where we will spend the night. 2nd DAY - On the following day we ascent to CARE' ALTO GLACIER and further on to the historically very important CORNO DI CAVENTO PEAK (3.400 m). The "White War" has left behind many remainders even at this elevated altitude. Crossing of LOBBIA GLACIER and descent to the mountain lodge MANDRON where we will spend the night (ca. 8 to 10 hrs.). 3rd DAY - Descent from MANDRON Lodge to BEDOLE Lodge where we have parked our mini-van; ca. 2 hrs. Back to Rovereto and/or your hotel. Solid boots, backpack, food and drink, light windcheater, long/short trousers, long/short-sleeved pullover, clothes to change. The rent of technical gear will be provided by mountain guides of our Alpine climbing School Arco. All Mountain Guides who are working for our Alpine school Arco are by law responsible for their work and are therefore have a third party insurance.